We have the Right to Play and Relax. 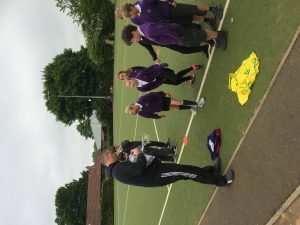 Mr Lavery our Active Schools coordinator has been in training us as playground leaders. 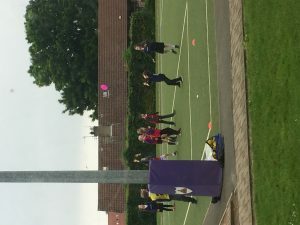 We have been learning how to lead Ultimate Frisbee! Today we achieved our Silver Award. We are ambassadors for Rights Respecting Schools. We are extremely proud of all the hard work from children and staff and now begin our journey towards GOLD! The Health and Well Being group was formed in the session 2015-2016. 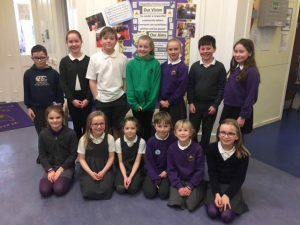 We have evolved over the last few years and are now the Rights Respecting Group as we feel this encompasses health and wellbeing, pupil voice and the rest of our RIGHTS that are important to us. 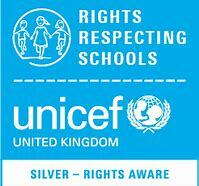 We are working towards our Silver Award: We are Rights Aware! When your in school take time to look at the steps we have taken on our journey so far. 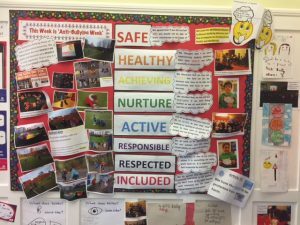 We have worked hard across the school to link our rights to our school’s aims. They were easily linked showing that our school works hard to endure we learn ABOUT, THROUGH and FOR our rights! 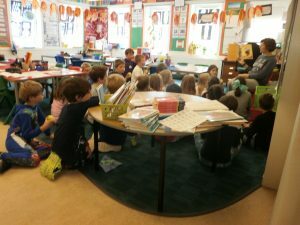 Primary 1 developed their knowledge about article 15. The right to make friends and choose them. 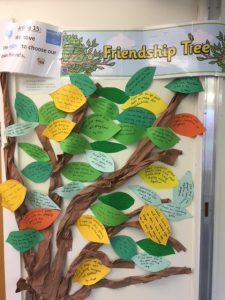 They made their own friendship tree. They reflect on this regularly. 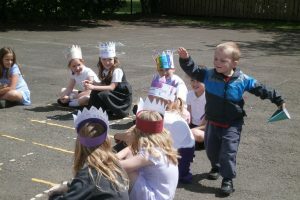 Primary 1 also did a topic on ‘Marvellous Me’ where they explored their RIGHTS. 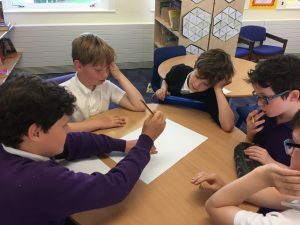 Primary 7 have been working on their topic of South Africa and have been exploring issues linked to discrimination. 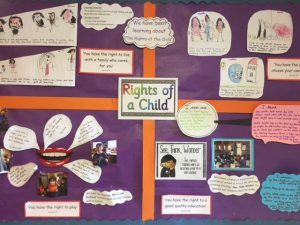 This has been an excellent topic to explore children’s rights. 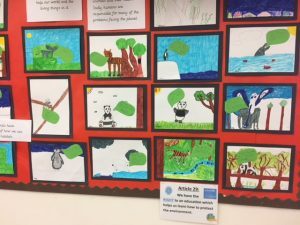 Primary 4 have been working on their topic about animals and the environments they live in. 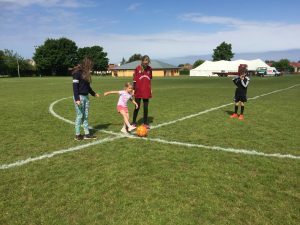 In particular their focus has been on the environment and why we have to look after and preserve it. 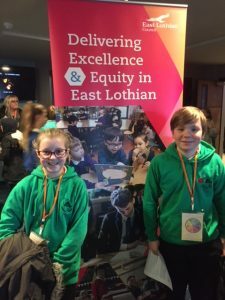 Two of our primary 7 pupils attended the summit and used their voice to express their ideas and opinions on how we can make education in East Lothian even better than it already is. This is an important part of learning FOR rights! 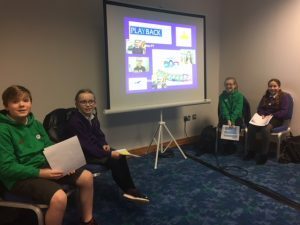 Some of our RRS reps attended the conference to share our excellent practise in using the ICE PACK throughout the school. 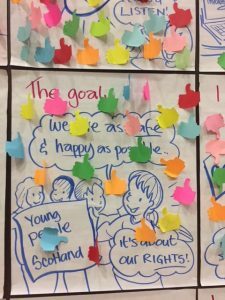 We were commended on how we have used it to embed our well-being indicators and our children’s rights. 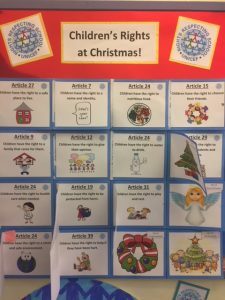 We made our own advent calendar to extend our knowledge about our rights. Each class took turns opening it and reflecting upon the right. 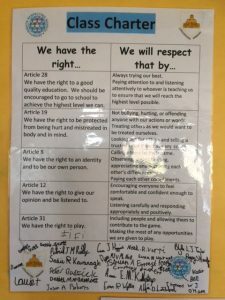 Each class also had an interactive copy to open daily so they could discuss the rights daily! 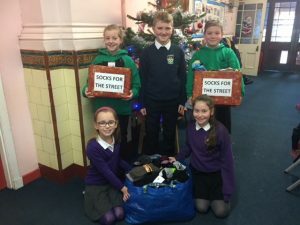 We started our own campaign in school to help collect socks for the homeless in Edinburgh. 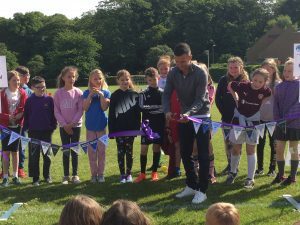 We were supporting a boy called show from Leith Walk Primary School. We understand that everyone should have the right to shelter but this does not always happen! During advent we collected in over 400 pairs of socks. A huge thank you for all your donations. 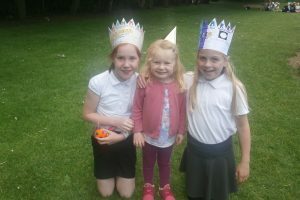 During one of our Focus Friday events we shared our expertise and skills through coming to school dressed or with a prop that symbolised our wider achievement. 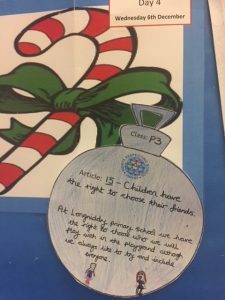 We have developed our SIP and linked the relevant articles linked to the UNCRC. 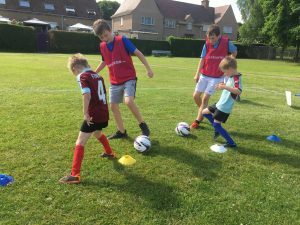 We work on this in mixed age groups throughout the school and will also evaluate the plan together in order to make next steps at the end of the year. 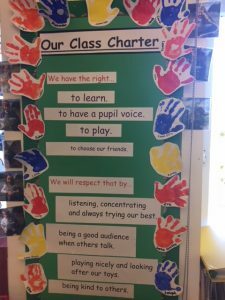 At the beginning of the term we created our own class charters. 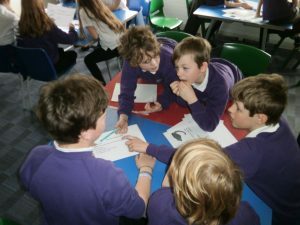 We worked collaboratively to discuss how we would respect the rights if others. 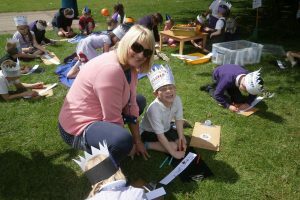 We have also created our playground and lunch hall charters through our Focus Friday events. 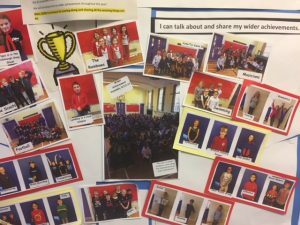 We developed our pupil voice board to demonstrate the power of the voice and how the children in the school can really help to make changes and influence what is happening in school. 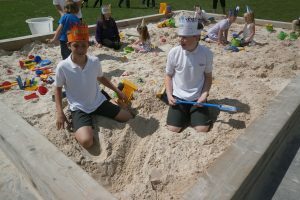 We aim for the children to be involved as much as they can in school improvement. We worked really hard on informing everyone about our wellbeing indicators. 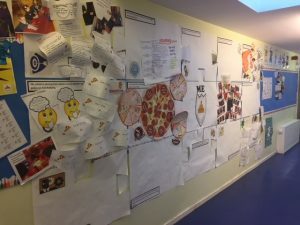 Through SHANARRI Fridays we explored each wellbeing indicator over the session. 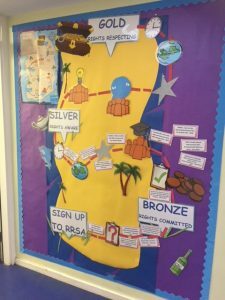 We linked the UNCRC to each session and understand how by having access to your rights you can achieve good health and wellbeing. At the end we had a SHANARRI party where everyone was INCLUDED. 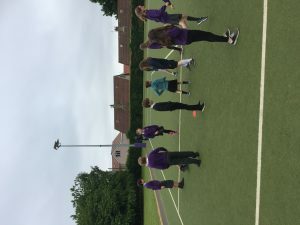 We took part in 8 fun games and activities which were all about promoting inclusion. 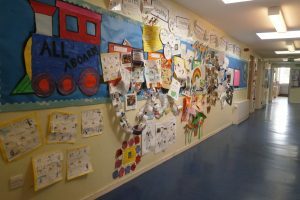 Each month we would add on our new learning about the wellbeing indicators to our SHANARRI train. We celebrated the day of change by focusing on the right of nutrition and the importance of a good healthy diet. 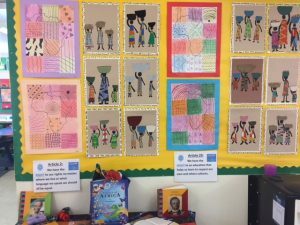 We explored and investigated famine around the world and understand that people are still fighting for their basic human rights. We investigated certain parts of the world and looked where these needs were and were not being met. We raised awareness of this plight all around the school. 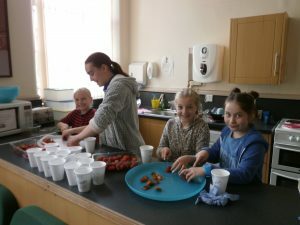 The children decided to have a healthy tuck shop, change teacher for part of the day, change day into night and come dressed in their PJs. Not only did we raise awareness but we also raised over £300 for the nutrition charity linked to UNICEF. Well done everyone! 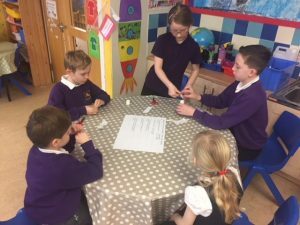 Primary 1/2 have been exploring the topic of water and decided to take on the water aid challenge. They set up the pipeline challenge in the playground for each class to participate in. Not only was this tricky but we had to work together as we realised how difficult it can be to transport water from one location to another. 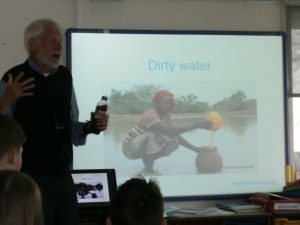 P1/2 also organised Water Aid workshops for the whole school to participate in. This was a great opportunity to learn about our basic human rights and how we can fight for other peoples rights throughout the world and how we can support them. hi Mrs Macfadyen I was so nervous to speak but did it. So glad you girls are looking forward to it! We have got lots planned. It is fantastic news Jadon! Looking forward to achieving our gold too.